The QBrand QBlog: Will a Nestlé-owned Uncle Tobys give Aussie consumers the Vita Brits? 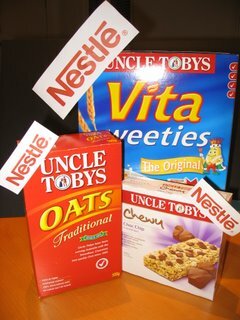 Will a Nestlé-owned Uncle Tobys give Aussie consumers the Vita Brits? I was interviewed today by Derryn Hinch about how consumers might react to the purchase of Uncle Tobys by Nestlé (in partnership with General Mills for the breakfast cereals). The short answer (as always) is that it depends...! Some may be concerned and react unfavourably to the acquisition of this "iconic" Australian brand by a global giant like Nestlé. This might even lead those consumers to avoid buying Uncle Tobys products. At the other end of the consumer spectrum, many just won't notice or care about a change of ownership, especially if there is no discernible change to the products that appear under the Uncle Tobys name. Between these two extremes, the reaction of the majority of Australian consumers will depend on how aggressive Nestle is in "Nestlé-ising" the Uncle Tobys brand and/or trying to reposition it. Uncle Tobys has long emphasised its Australian-ness, e.g. through its involvement with sports such as surf lifesaving and in many of its advertising and packaging images. Consumer perceptions of Nestlé as a large multinational or global firm with many different product lines and areas of operation could conflict with current perceptions of Uncle Toby's as a small(er) Australian company making Australian products (notwithstanding the fact that it has been New Zealand-owned for some time... close enough? ), giving consumers less reason to prefer Uncle Tobys products over competing brands. Uncle Tobys brand positioning is also built around the idea of "wholesome" breakfast and snack foods based on cereals and fruit. By contrast, Nestlé is perhaps better known to Australian consumers for convenience and indulgence products like Milky Bar, Kit Kat, Aero, Nesquik, Milo, as well as Nestle Peters icecream brands like Heaven. This might also create conflicting or negative brand associations for a Nestlé Uncle Toby's or Uncle Toby's by Nestlé brand, especially among parents concerned about their children's nutrition and childhood obesity. I have no wish to fan the flames, but it should be noted that Nestlé has long been the subject of an international boycott by a small but vocal group of consumers who hold that Nestlé has acted and continues to act unethically in its marketing of infant formula in the third world. While this began as long ago as the 1970s, it is an association with the Nestlé brand that still surfaces in consumer focus groups today. For some Australian consumers, this alone will be enough reason for them to stop them buying Uncle Tobys products immediately. Just how obviously and rapidly Nestlé will communicate its ownership of Uncle Tobys in advertising and product packaging remains to be seen, as there are some contradictory precedents. Nestlé has prominently re-branded Peters ice cream ("The health food of a nation") as Nestlé Peters, and what were once Rowntree confectionery brands are now Nestlé Kit Kat and Nestlé Aero respectively. The Nestlé products that already compete with Uncle Tobys in the breakfast cereal category - Nesquik, Milo and Cheerios cereals - are also very prominently Nestlé branded. On the other hand, Nestlé has (so far) let the Life Savers brand stand alone, and you won't find the familiar Nestlé logo on a pack of Purina Lucky Dog! In summary, I would advise Nestlé to go very gently on the corporate (Nestlé) branding of Uncle Tobys, at least until they have done some thorough consumer research to establish what negatives might be associated with the change of ownership. It's a significant investment: Nestlé has paid about 11.5 times the 2005 earnings of Uncle Toby's, reflecting a very high valuation for the goodwill and potential of the Uncle Toby's brand. But whether it's brand extension or brand acquisition, the relationship between one brand and another is always a two-way street. It's possible, in a worst-case scenario, that negative consumer reaction to the acquisition could render the Uncle Tobys brand LESS valuable in the hands of Nestlé than it was under Burns Philp's ownership. So is Uncle Tobys owned by Nestle yet or not?? Yes, Nestle bought Uncle Tobys in 2006. You can find the Uncle Tobys products listed on the Nestle website.